Ice skating is available at Forsythe Park, and cross-country enthusiasts enjoy skiing the challenges of Lost Marsh and Forsythe Park. At Lost Marsh Golf Course, families enjoy after-summer hiking, dog-walking, biking or sledding down the course’s rolling hills in winter. Mayor Thomas M. McDermott, Jr and the Hammond Port Authority invite you to walk and bike the trails in and around George Lake, Wolf Lake and Lake Michigan as the crisp winter winds whip through the northern neighborhoods of Hammond. 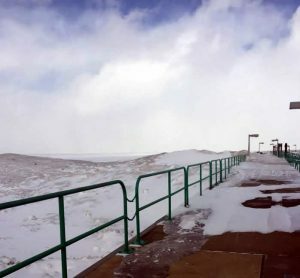 From the Lakefront bird sanctuary to the new trail system along Wolf Lake to the Observatory Pier on 125th Street, these nearby mini-destinations – STAYCATIONS – are the place to be in winter. Come discover or rediscover this special place in Northwest Indiana. For additional information, call the Hammond Port Authority at 219-659-7678.